An old garden favourite that is free-flowing and produces flowers in lovely kaleidoscopic colours. If you’re a nature lover, grow this Garden Jewelweed as it is a magnet to birds, butterflies and bees. 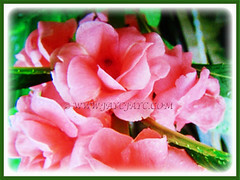 Botanical Name: Impatiens balsamina (syn. : Impatiens giorgii, Hydrocera foemina). Common Names: Garden Balsam, Garden Jewelweed, Touch-me-not, Rose Balsam, Spotted Snapweed. Etymology: The genus name, Impatiens comes from the Latin word impatiens, meaning impatient, referring to the violent seed discharge from the ripe pods. The specific epithet balsamina is an alternative name for several wine grape varieties. Origin: Native to Southeast Asia including India, Bangladesh, Burma and China. It is widely cultivated in many parts of the world. 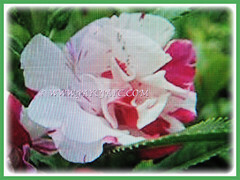 Plant type: An ornamental and herbaceous flowering plant. Features: Impatiens balsamina is a species of the genus Impatiens that comprises of about 850-1000 species of flowering plants. A fast-growing plant, it is an erect and sparsely-branched annual and herbaceous plant growing to 20–75 cm tall, with a thick, but soft stem. The light green, elliptic to lance-shaped and deeply serrate leaves are petioled and spirally-arranged, 2.5–9 cm long and 1–2.5 cm broad. 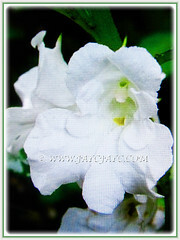 It produces showy 3-petaled flowers, 2.5–5 cm diameter and often spotted. Truly a jewel of a plant. The bisexual flowers bloom singly or in small stalkless cluster of 2-3 from the leaf axils. They come in variable kaleidoscopic colours, such as pink, red, mauve, lilac, white, and even in bi-colour. They are pollinated by bees and other insects, and also by nectar-feeding birds. The fruits are fuzzy capsules, starting off green-coloured. They turn to brown when mature and split open easily to scatter the small seeds. The mature seed capsules are highly dehiscent. 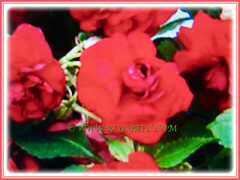 Culture (Care): Impatiens balsamina or Garden Jewelweed can be easily grown with minimum care. Light: Full sun to semi-shade though best in partial-shade. Soil: Humus-enriched, loamy and well-drained soils. It is drought-tolerant. Others: Pinch back stems of young plants when they reach about 10 cm in height. 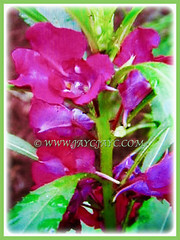 Balsam develop good root systems and transplant well but may wilt for a day or two after transplanting unless watered frequently after being relocated. Generally free from serious insect or disease problems. However, do watch out for caterpillars, aphids and plant bugs that love to gnaw at the leaves. For subtropical and temperate regions: Hardiness: USDA Zone 2 – 11. 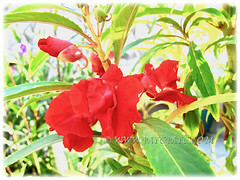 Grow Garden Balsam as a housplant indoors or in a greenhouse with good light. To propagate, set seeds 6-8 weeks indoors before last frost date. Germination takes 8-14 days at 21°C. Set out plants after the last frost date. Balsam grows poorly in zones 10-11 during the summer unless placed in total shade. In zones 9b-11, they are normally planted in the fall for winter and spring colour. 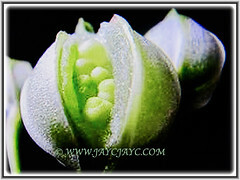 Propagation: It is propagated from dehiscent seeds and even self-seed. 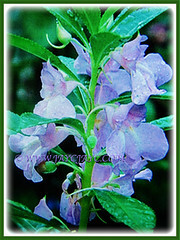 Usage: Impatiens balsamina or Spotted Snapweed with its ornamental blossoms will be excellent in shady beds or borders. In mass planting, grow with plants that produce varying coloured flowers to add interest and colour. It can be ground-grown or in above-ground planter. Also, useful for container gardening outdoors or indoors as houseplants. 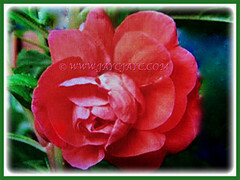 Ideal as edging plants along walks and paths to enjoy their beauty. It is a magnet to birds, butterflies and bees. 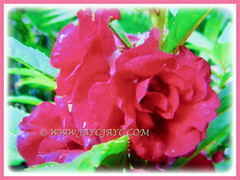 It is being used as indigenous traditional medicine in Asia for rheumatism, fractures and other ailments.